As technology advances, it becomes an integral part of the everyday, inevitably affecting and changing our reality. My work responds to interactions with the screen or this other space as an entrance to the psychological. I create installations that function alongside video to investigate and critique the formation of the self as it relates to larger societal issues. Each installation is unique, acting as a response to the spatial-environment and a metaphor for the ever-changing self. The objects and materials present, whether deconstructed, over-turned, or covered in paint, point to a larger thematic whole. Comforts of ordinary life, like that of a chair or bedding have been fragmented, exposing what lies beneath the surface. This metaphor is a signifier of the brain, which not only forms the complex human, but also at times enslaves or fails in basic understanding and coping mechanisms. 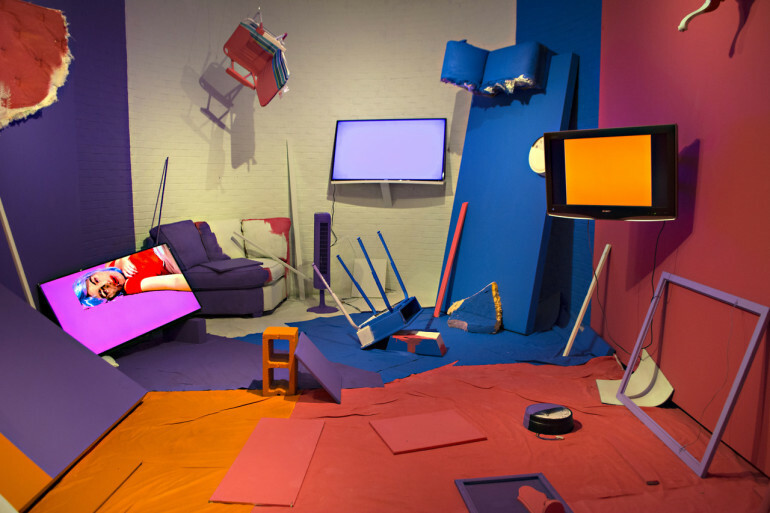 Televisions display personal accounts of obsessive-compulsive behaviors situated next to brightly-colored, home-interiors, employing tension as a tool in my work. This provides an experience that spans throughout time and space, shifting away from the art object and uplifting this no-place, place, situated among memories created and imagined. The work aims to align the audience with the subject matter, in turn relativizing their situation as part of the whole. Various media are used to reflect daily interactions and internal struggles between media, technology and the individual. Please join the department in congratulating Brittany on her award!